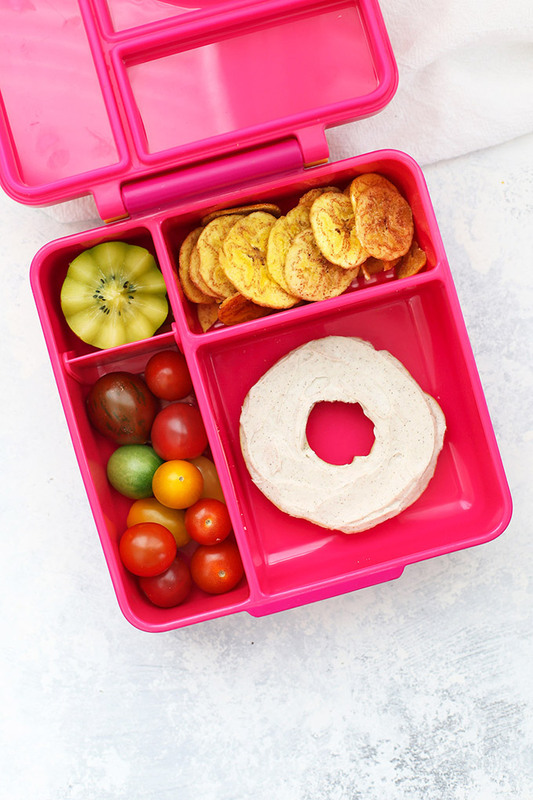 2 Weeks of Healthy School Lunch Ideas – Here are 10 easy, delicious, kid-friendly lunches, plus a free printable planning sheet for creating your own combinations! I don’t have a lot of time! 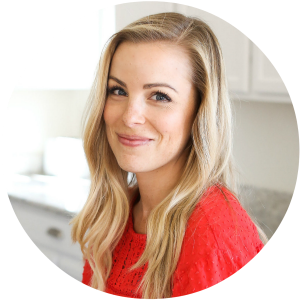 – Instagram and Pinterest will show you beautiful, intricate lunches that might have you feeling overwhelmed. Don’t worry. My plan is to share easy, adaptable ideas that will free up time and get lunches packed without a bunch of extra effort. No special skills required! What do I pack? Whether you’re dealing with picky eaters, food allergies, or bored kids, the “what are we having?” question is always there. I’ll arm you with over TWO WEEKS of unique, adaptable ideas you can cycle through or use as inspiration when boredom strikes. But I’m dealing with food allergies/picky kids/sensory issues! Girl, I got you. I’m there in the trenches, too, so I know how it goes. My ideas are easy, adaptable, and work for a bunch of different diets. 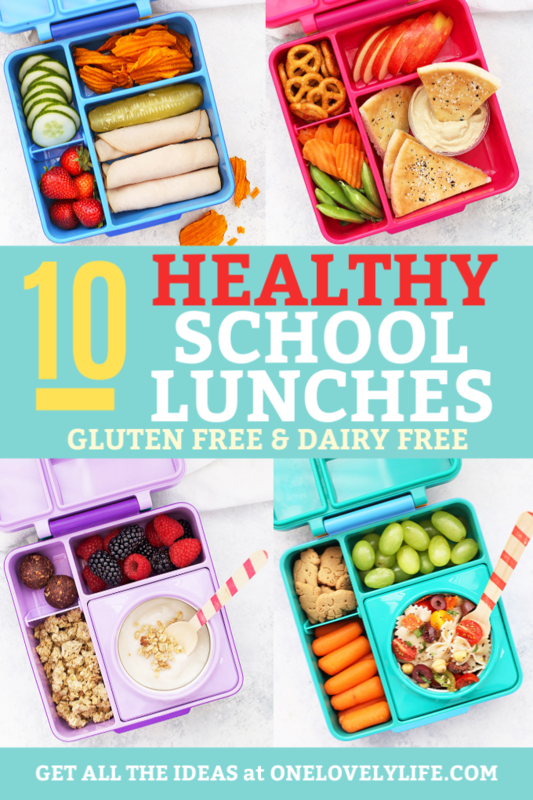 Each of these school lunch ideas is gluten and dairy free (or not!) and many are also vegetarian, paleo, or allergy friendly. Nothing requires a lot of fancy skills, and all have been kid-tested (though, spoiler: my kids NEVER eat their vegetables). PRO TIP: Follow a Formula. 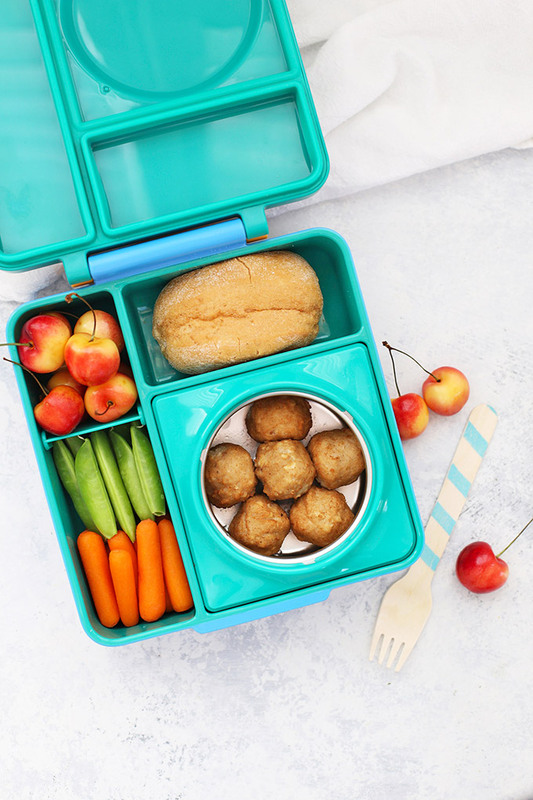 When packing our lunches, we shoot for a rough formula for a balanced meal. This makes decision-making easy. With our basic formula, I don’t worry about making a brand new lunch every single day. I only choose 2-3 kinds of lunches to pack each week. 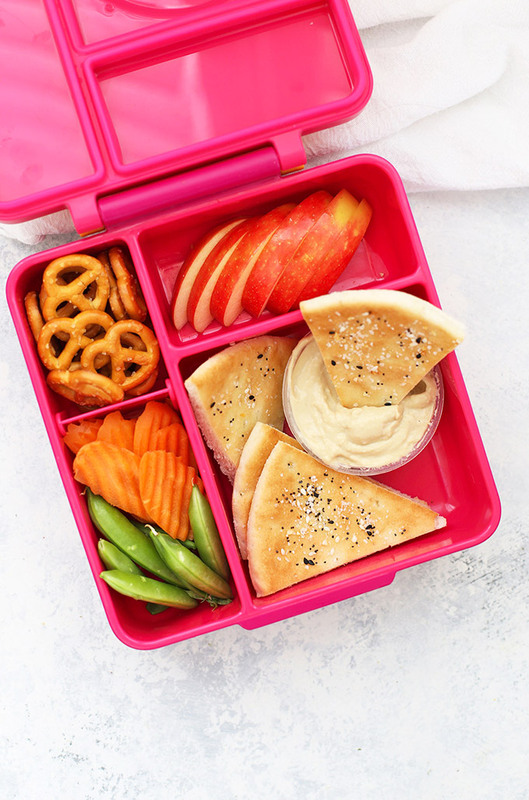 All you have to do for the perfect school lunches is mix and match from the categories above! I even made a little free printable for you to use to come up with your own ideas! You can print it out in COLOR or BLACK & WHITE and use it to come up with school lunch ideas that work for you and your needs. Then, just hang it on the fridge, in the pantry, or on the inside of cupboard door when you find yourself in a rut. 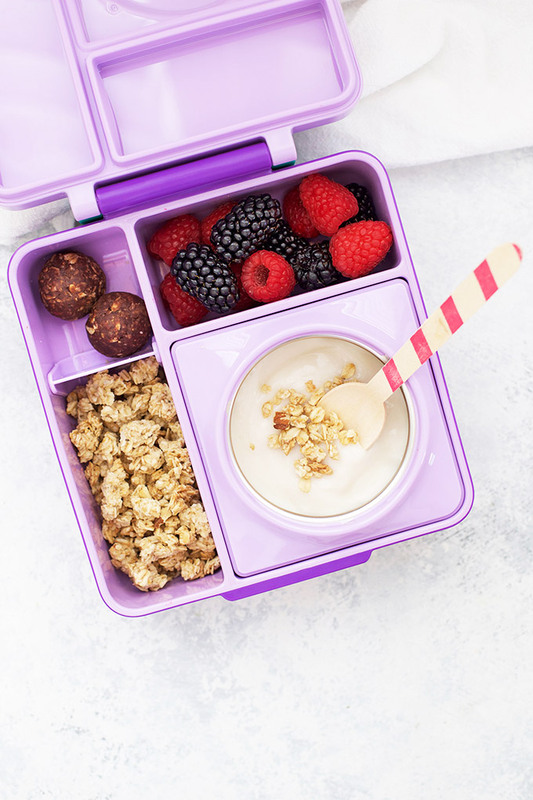 I pack dairy free yogurt (our favorite is So Delicious brand coconut milk yogurt), gluten free granola, fresh berries, and a few energy bites (I make these with cashew butter for school!). 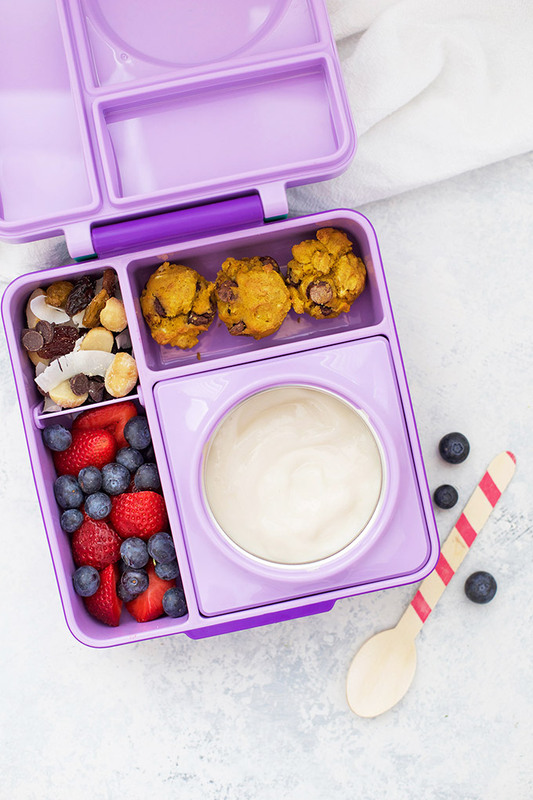 The little thermos insert in the Omie Box lunchbox I used above keeps your yogurt contained and cold! This is a great hot lunch option (or cold, if your kids don’t mind!). Pack cooked meatballs (these are chicken), a gluten free roll (this is Udi’s brand), veggies, and whatever fruit is in season. 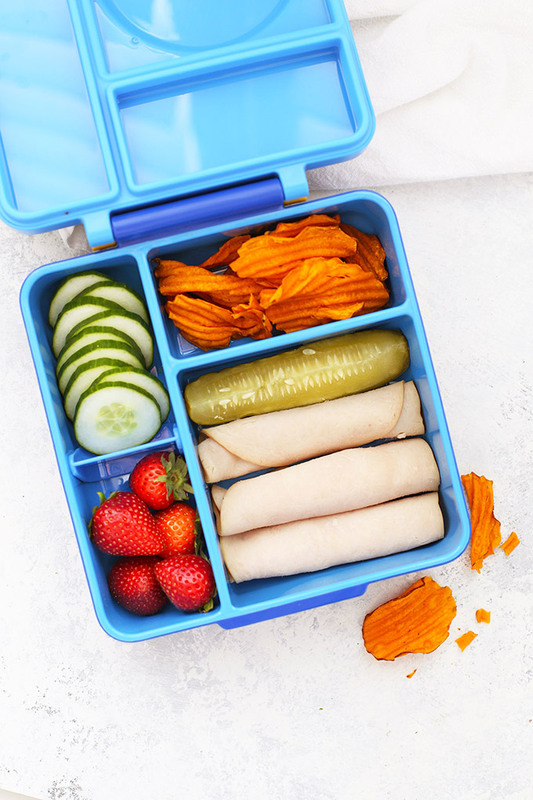 This is easily paleo if you swap out the roll for something else–energy bites, almond flour crackers, sweet potatoes, etc. The thermos insert in the lunchbox I used keeps the meatballs warm, or you can pack a separate thermos if you’re using another type of lunchbox. You can pack up a single serving of homemade or store-bought hummus, or pick up the store-bought single serving portions to use. Then, add a little fresh fruit and your favorite veggies, gluten free pretzels, and some gluten free pita crisps to dip in it. To make the pita dippers, I brush a gluten free pita (like MyBread brand) or pizza crust (like Udi’s, Three Bakers, etc.) with a little olive oil, cut into triangles, then broil for about 2-3 minutes on a sheet pan in the oven. Sprinkle with some coarse salt and maybe a little Everything Bagel Seasoning (Sophie loves it!). Voila! My mom used to make these for us when we were little. She’d cut a little wedge of cheese and wrap some turkey or ham around it, then fasten it with a toothpick. Since we’re dairy free, we just roll up the turkey or ham, but you could totally wrap the turkey around pickle slices, bell pepper strips, etc. if you like. Serve this with a little pickle wedge, some fruit and veggies, and something crunchy, like almond flour crackers, sweet potato chips, or even something like popcorn! I love waffles almost as much as Leslie Knope from Parks and Recreation does. My kids are in the same boat! 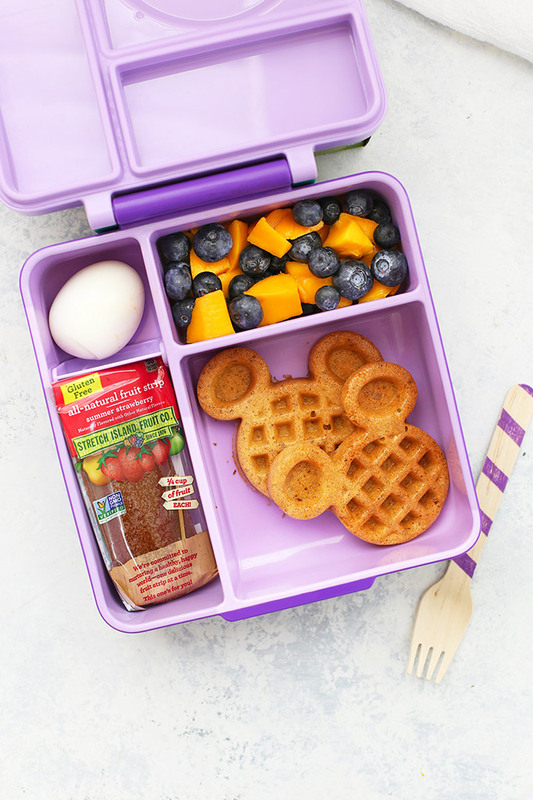 Any time you have leftover pancakes or waffles, you can tuck them into school lunch. We use this little Mickey Waffle Iron that makes the perfect packable-sized waffles, but you can use any kind you have. Round out the lunch with some fresh fruit, a protein (like a hard-boiled egg or some yogurt), and something fun, like a fruit leather or some trail mix. When I plan to pack waffles or pancakes, I typically don’t pack syrup or jam since it’s so messy. Instead, I flavor the waffles themselves a bit more than I usually would, by adding cinnamon or a little extra syrup to the batter, or using a flavored waffle (like pumpkin, berry, or gingerbread). 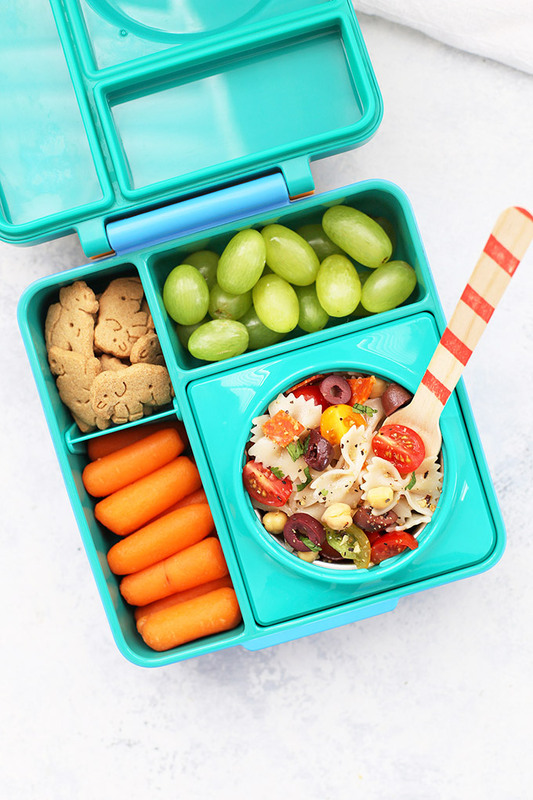 Salad can be a great option for lunch, but green salads can get soggy (my kids can’t maneuver things like a mason jar salad or a container of salad dressing without spilling), so pasta salad is a major winner! We use gluten free pasta, like these bowties or this rotini. You can mix and match your favorite toppings. My kids love pizza-inspired pasta salad, but you can go Greek, Caprese (with diced mozzarella ands basil), or Tex-Mex (like this Taco Pasta Salad). On the side, we go with veggies, fruit, and something crunchy. My kids love little gluten free animals crackers for dessert! Sometimes keeping things interesting is as simple as swapping out bread for bagels. Use them for a bagel sandwich, or schmear them with your favorites–nut or seed butter & honey, a bit of jam, or cream cheese. For a dairy free version, we like Kite Hill almond cream cheese mixed with a tiny drizzle of pure maple syrup and a sprinkle of cinnamon. It’s one of Sophie’s favorites! On the side, a simple combo of fruits, veggies, and something crunchy (in this case, plantain chips!) makes for a delicious lunch. *For GF Bagels, we like Canyon Bakehouse (ALL the flavors!) and O’Doughs Bagel Thins (which are a more manageable size for my kids). This is a fun, easy lunch. 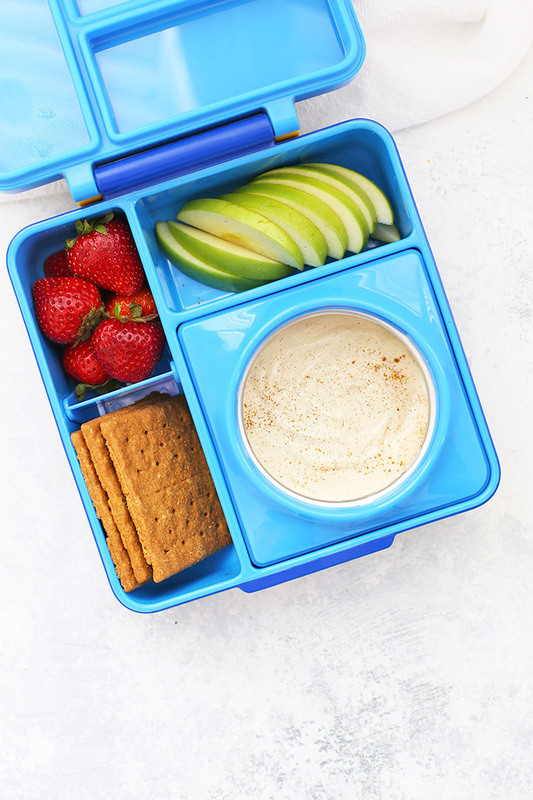 We start out with a little fruit dip (the thermos insert of the Omie Box helps keep this contained and cool), then we pack the rest of the box with ALL the things to dip in it! Sliced apples, fresh strawberries, and some gluten free graham crackers or animal crackers are my kids’ favorites. For the dip--use 1/2 cup of your favorite plain or vanilla yogurt (dairy or non-dairy). Mix in 1 Tbsp nut or seed butter (At home we love peanut butter. At school, we go for almond or cashew butter), and 1/4 tsp cinnamon. If your yogurt is unsweetened, you’ll probably want to add a little pure maple syrup (or your favorite sweetener) to taste. So again, that’s 1/2 cup yogurt + 1 Tbsp nut/seed butter + 1/4 tsp cinnamon + sweetener to taste. My kids love breakfast foods, so this is a no-brainer. Use your favorite yogurt (dairy or non-dairy), some fresh fruit, a little trail mix, and then some little muffins. You can halve or quarter traditional-sized muffins to fit, or use a mini muffin pan to make mini ones. Trail Mix for the Week – A ton of different combinations! This is one of my kids’ favorite lunches. You can mix and match just about any of the components, but think of this like a little cheese board. Since we’re dairy free, we focus on the meats, olives, veggies, and crackers, rather than a variety of cheeses. You could use anything here–salami or pepperoni, ham or prosciutto, cubes or slices of cheese (if it fits your dietary needs), any color of olives, nuts (if they fit your diet), crackers or breadsticks, apples or pears, etc. Then, for a treat, we use chocolate covered almonds or raisins to go with it. One of our favorite gluten free cracker brands right now is Van’s. They’re not as nutritious as almond flour crackers, but they’re really delicious and have a texture that’s similar to Wheat Thins. We like The Perfect 10 and Fire-Roasted Veggie flavors best. Don’t Forget Your FREE Printable! Okay, there you have it! 2 weeks of ideas with LOTS of room for variations and changing things up! 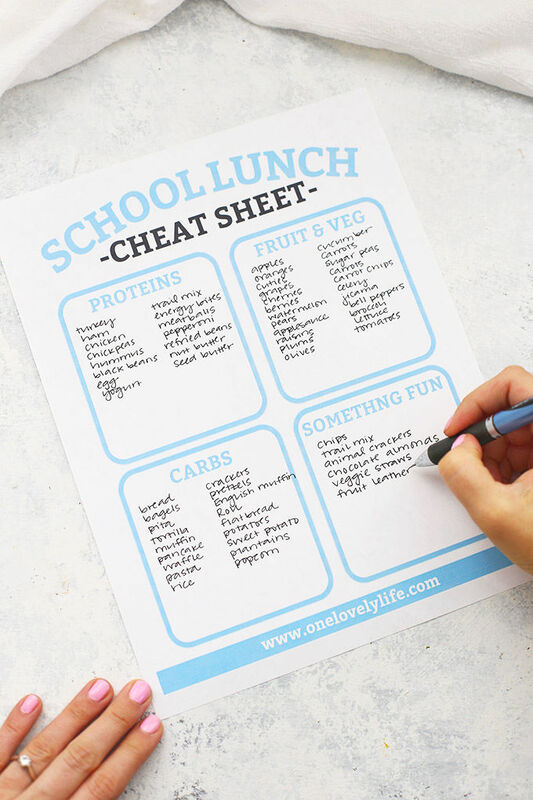 If you missed it, you can print out your own Lunch Packing Cheat Sheet in COLOR or BLACK AND WHITE to keep on the fridge or in the cupboard to get your wheels turning when you get stuck! PS – Looking for the lunch boxes or wondering what lunch boxes or bags to get? 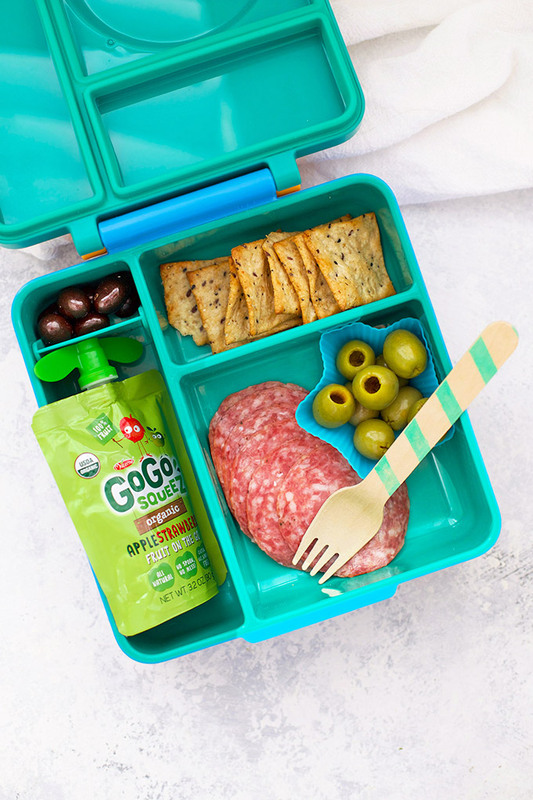 You’d love this post all about Lunch Gear! I discuss the pros & cons of each lunch box and share the reusable bags we use, too! Absolutely fantastic ideas. Thank you SO much!!! I really LOVE this post! Thanks so much! I’m so glad, Shannon! I hope it’s helpful! It was helpful for ME to put it together and have all the ideas in one place! Really loved this! 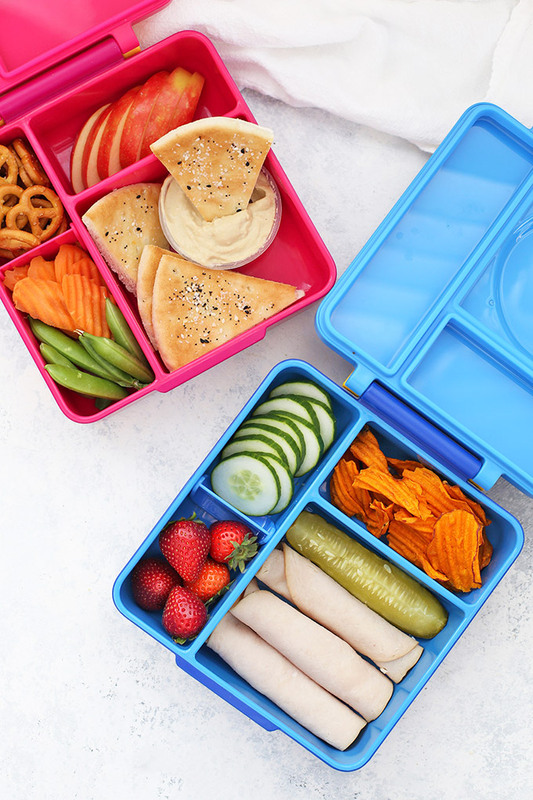 Gave me some helpful ideas to try and I love the lunchbox containers. Oh, I’m so glad! Thank you for sharing! Where do you buy those lunch containers? I’m interested to know what the container is and where I can get one! You didn’t post 1 sandwich!! That’s awesome! Everything looks so great and i know my daughter will love the variety! Thanks!! It’s fun to break out of a sandwich rut every once in a while, right? I’m so glad it was helpful! Btw couldn't find the printable..
I’m very sorry, I restart my browser and now the printable works..
where did you buy the lunch box?